With Christmas approaching, loads of families are likely to be forced into games of Monopoly, Cluedo and the like as they wade their way through the festive holidays. The good news is that, for a small cash outlay and a trip to a shop you wouldn’t usually visit (or the online equivalent), you can pick up some modern family board games that will be way more engaging, loads more fun, and probably a lot shorter than you’d think. So ignore the ads for the usual crap on TV and check out some of these out instead. The games below are a combination of board games, balancing (dexterity) games and word games which offer a whole lot more than their standard toy shop equivalents. They’re also a similar price, have similar ease of entry (in terms of rules) and really aren’t anything to fear – promise! There are no dungeons, dragons, zombies or spaceships on this list (although they’re might be a monster or two…). The last three German Game of the Year winners are in here, which means they’ll be easily available. If you don’t have a friendly local game store, I’d suggest visiting the Board Game Prices website if you’re interested in any of these (or if you’re in Cambridge, definitely try downstairs in Heffers book store). Alternatively I’ve previously done Top 10 lists for stocking filler card games and also games for 5-8 year-olds if they’re more likely to be up your alley. Or get in touch with a specific request and I’ll see what I can do. 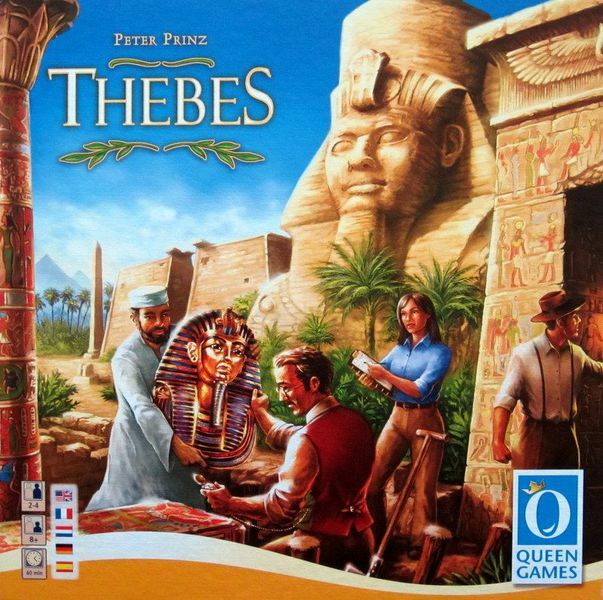 Thebes is a classic family game that adds a few gamer concepts to a simple set collection game. Move around the board collecting cards that will give you more searches when you go on your archaeological expeditions – then push your luck and see what you find. Once you think you’ve gained enough knowledge of a dig site, you head there to search. This involved taking a number of picks from a bag matching your location – some of which will have treasures, while others will just be blank. Sure, its super luck based but that makes thematic sense and creates a lot of laughs as people draw from the bag – and there are ways to help mitigate against the luck. Take the basic concept of dominoes (tiles made up of two squares, one of which you need to match), add a simple drafting system (if you choose a good domino this turn, you’ll have a later pick next turn), and add a puzzle element (players create a 5×5 grid with their choices, trying to match terrain types to score points) and bingo! You have a classic. If only it were that easy – but with Kingdomino, that’s what you get. It was the 2017 Spiel des Jahres winner (German family game of the year) and it’s easy to see why: the artwork is beautiful, the dominoes nice thick cardboard, the game play simple but the puzzle challenging. And for less than £20, it’s also a bargain. The age range of 8+ is pretty accurate too, but it still offers a fun challenge for adults – so it should find a place in most households. This fantastic game has been around in one form or another for almost 40 years, but unlike many older games it has really stood the test of time. As well as being a fun game for adults it’s a great learning tool for children for learning about odds and percentages; while the big chunky plastic pieces are also suitable for any occasion and audience. You can add extra people by simply playing teams (just take it in turns on the dice), making it a fun light party game too – and at about 30 minutes, it certainly doesn’t outstay its welcome. A game every household should have. 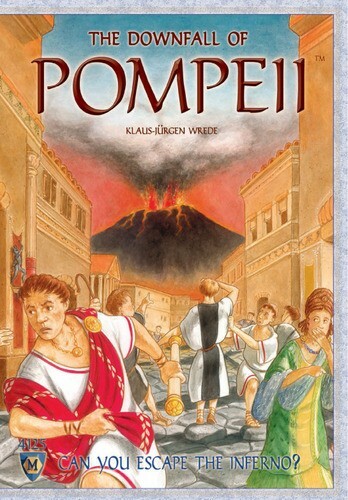 If you like the meanness or competitive nature of Monopoly, but not the tedious luck dependent game play and ridiculously long play time, you should take a look at Pompeii. This family board game first sees you populate the doomed city with your pieces – before you all start making a run for it as the lava starts to flow. And yes, it’s the players who choose where the lava tiles go – so you’ll soon be condemning each other’s citizens to the flames with evil laughter. It’s a simple game with quite a lot of genuine strategy when playing with two – but with four players it just turns into a riot. 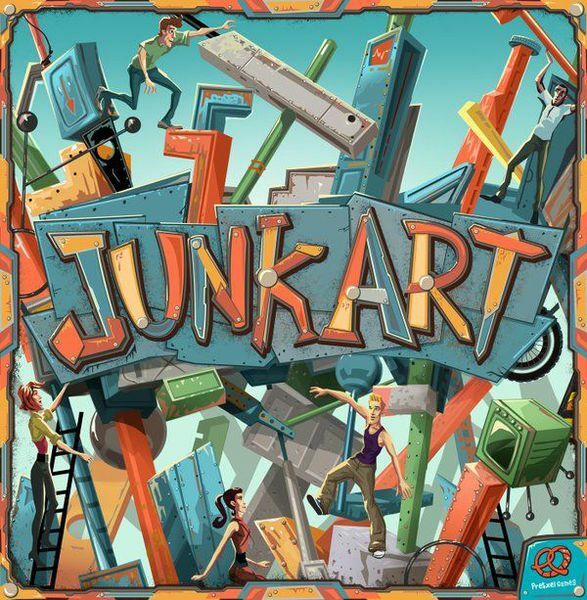 If you liked a bit of Jenga, but found it got old fast, look no further than Junk Art to take things up a notch. It’s basically a box of variously shaped wooden blocks which each player gets the same set of – that you then balance on top of each other. The important twist, though, is that you’re doing this differently every time. There’s a whole bunch of scoring cards that come with it which keep the game fresh: one game you’ll be trying to get extra points for having the highest stack, while next game you may add a couple of pieces but then have to move clockwise to the next person’s stack – completely changing how you’d play the game. for a cheaper small-box experience, with less rules and variety but a lot of fun all the same, look out for the lovely Animal Upon Animal: roll a dice, then add the piece it tells you to the growing pile of fun wooden animal pieces. A gorgeous, simple and more portable balancing game that always raises a laugh. A genuine innovation in gaming over the past decade has been co-operative games: where the players are helping each other, rather than competing, in an attempt to beat the game. Probably the purest example that’s a great introduction to the genre is Forbidden Desert – especially as, if you like it, it’s a great introduction to one of the classics of the genre (which is a little more complex): Pandemic. 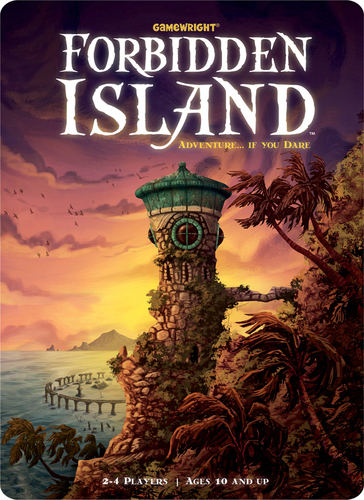 Each player has a character, and each takes a turn, as you explore an island trying to find hidden artefacts before it sinks into the sea. But on your turn you can discuss the best course of action for yourself, as each player has an individual skill only they possess. You can of course ignore what others suggest and do your own thing – but if you fail, or someone dies, the whole group fails together. If you prefer the idea of one against many, the classic Scotland Yard still holds its own in today’s market. Here one player is the criminal (using hidden movement) trying to escape from London, while the others are police officers trying to catch them before they escape. Again, this game can lead on to more complex modern equivalents if you find you like the genre (Letters from Whitechapel, Fury of Dracula etc). Word game are a Christmas standard and the hobby market has been no slouch updating the genre. 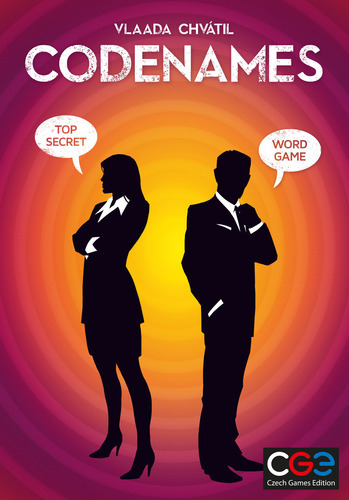 Codenames is an excellent example, pitching two teams against each other to match a variety of words under a single one-word clue – while having to avoid other words or face defeat. The 2016 Spiel de Jahres winner has spawned several different versions since, including one where the words are replaced with pictures and a co-operative version (Duet) for two players. This year also saw two contenders released to challenge the Codenames team word game crown. Trapwords is a take on Taboo, but where the opposing team makes up the taboo words and you don’t know what they are (it’s a really clever twist). Decrypto adds more of a crossword element, where you’re trying to give clue to your team without being too obvious, as the opposing team can also work out your words over a series of rounds as the clues start to mount up. Finally, if you like a bit more creativity, Dixit comes with a stack of beautifully drawn but surreal art images. Your job is to say a phrase that describes one from your hand – enough so some people will guess which image you’re talking about, but not exact enough that everyone will (you get a point per correct guess – but if everyone guesses right you get no points). Once you’ve said your phrase, each other person looks at their own cards and puts one into a pile with yours, which is then shuffled. If people choose someone else’s card instead of yours, whoever put that image in gets a point – which keeps everyone involved throughout. Abstract games have long been family favourites and Azul ticks all the boxes: simple rules, gorgeous on the table and it can be super mean once you get used to it – but it’s short enough that a beating is easier to take, as you can just go again! Players take it in turns to choose tiles from a central area, trying to make sets on their own score card to complete lines and get points. But you always have to take all of an available colour, so as as tiles are taken big sets begin to appear – and if you have nowhere to put them, you’re going to face negative points. It’s simple but thinky, creating a great atmosphere around the table. Azul is actually on my own Christmas list this year – as is Patchwork, another abstract game that looks beautiful on the table. This one is only for two players and plays in around 30 minutes. You’re reach trying to fill your own nine-by-nine grid with the gorgeous patch art tiles, but they’re all different shapes (Tetris style) and you can’t always afford the ones you want/need. Whether it’s kids (about 8+) or adults, if you’ve got a competitive family that likes chucking dice then it doesn’t get much better than this. Each of you is a monster on the rampage, but only one can win – so you take turns chucking dice to defeat your opponents. The twist is that one of you is in the middle, and while you are you’re earning points. While in the middle you’ll also damage all other players with your attacks – but you can’t heal, and all the other players automatically have to attack you! This push and pull, plus a bunch of fun cards that give each of you unique abilities, can make it an absolute riot. The game certainly isn’t for everyone, but with the right crowd it can be great fun – and the production quality is once again excellent. This will come as no surprise to anyone who knows me or reads the blog, but no game has helped me convert non-gamers to the cause as effectively as Ticket to Ride. It combines a simple set collection card mechanic with route building on a large map, making it accessible – but also competitive and quick. The basic map that comes in the box is just that, but there is a slew of expansion maps available that each add their own clever little rules to the base game. In fact there’s an alternative starter set (Ticket to Ride: Europe) which players may want to get instead, if you’re happy to have a slightly more challenging rule set straight out of the box (it really isn’t that much more complicated). 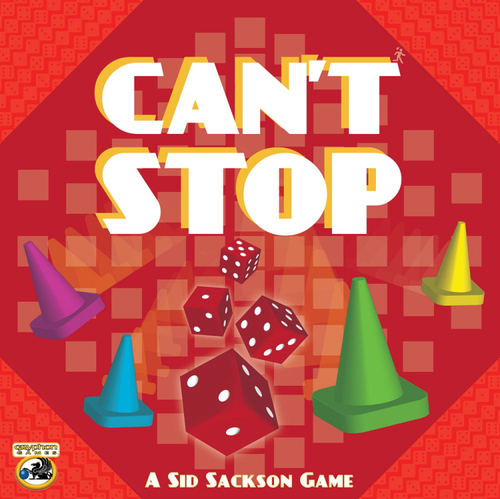 I should also note here the two other family hobby games that have ruled the roost in terms of sales over the past couple of decades: Carcassonne (a lovely, simple tile-laying game) and Catan (a game of building and trading, where you really need to trade to make it fun). Both have lost a little of their lustre for me over the past few years, but it’s not by accident that these games have introduced millions of new gamers to the hobby. Depending on your crowd, these can both be great picks in the right group.